It is true when one says that prevention is better than a cure. A and R Hoods is aware of how important it is to provide a high level of safety for your Moses Lake commercial or industrial kitchen. We have been providing many types of kitchen cleaning and maintenance services over the past 25 years. With our expertise and proven experiences, we have exceeded time and again the expectations of our many clients from Moses Lake to Renton. One of the services we offer includes fire extinguisher inspection. Fire extinguishers have expiration dates and must be properly stationed at accessible places within your restaurant, complete with instructions. A and R Hoods can help you with any fire extinguisher inspection services that your Moses Lake business requires. Fire extinguishers must always be available and easily accessible in any Moses Lake commercial or industrial kitchen. A and R Hoods offers fire extinguisher inspections to our clients in the Moses Lake and Eastern Washington area. Our fire extinguisher inspection includes checking the expiration date of your fire extinguishers, and that it is properly capped and stationed where it is visible or accessible for emergency situations. Our goal is to make sure that your Moses Lake commercial kitchen is equipped with fire extinguishers that can prevent damage and loss to equipment and protect the lives of your customers and staff. 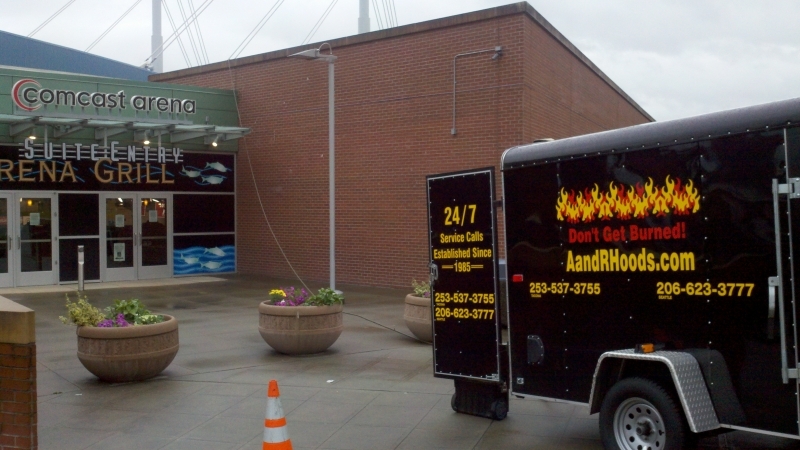 A and R Hoods provides fire extinguisher service to clients located in the greater Renton, Seattle and Western Washington areas. We will make sure that your industrial kitchen is guaranteed to be in compliance with national, state and local requirements. Fire destroys just about everything; A and R Hoods will make sure that your commercial kitchen will have fire extinguishers that are appropriate for your facility and readily available and fully charged for immediate use. Fire extinguishers are life and property safety devices and are greatly important in any type of commercial or industrial kitchen. It is also proven to protect the environment by controlling the fire at its early stage and preventing further damage to facilities and most importantly to lives of customers and employees. With A and R Hoods, we provide fire extinguisher services to make sure that all of your Renton and Moses Lake fire extinguishers are in the right places, readily accessible for emergency use and in its best condition to ensure that possible fires will be controlled.